He is also an Adjunct Professor in Te Ipukarea – the National Māori Language Institute. Te Wharehuia is one of the three New Zealand Fellows of the International Centre for Language Revitalisation. 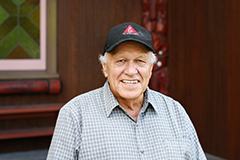 Te Wharehuia was a Professor of Māori at the University of Waikato from 1993 to 2000. He has served on several Boards and Committees including Te Papa Māori Advisory Committee, Te Taura Whiri i te reo Māori, Tertiary Education Advisory Committee, Whakaruruhau Reo for the New Zealand Qualifications Authority and is still currently a member of the Board for New Zealand Geographic and the Waitangi Tribunal. Te Wharehuia has been involved in numerous Māori performing arts competitions as he is frequently asked to be a judge. He was made a Companion of the New Zealand Order of Merit (CNZM) in 2012 for services to the Māori language. He has also been awarded a QSO.